The senator’s point is hard to argue. 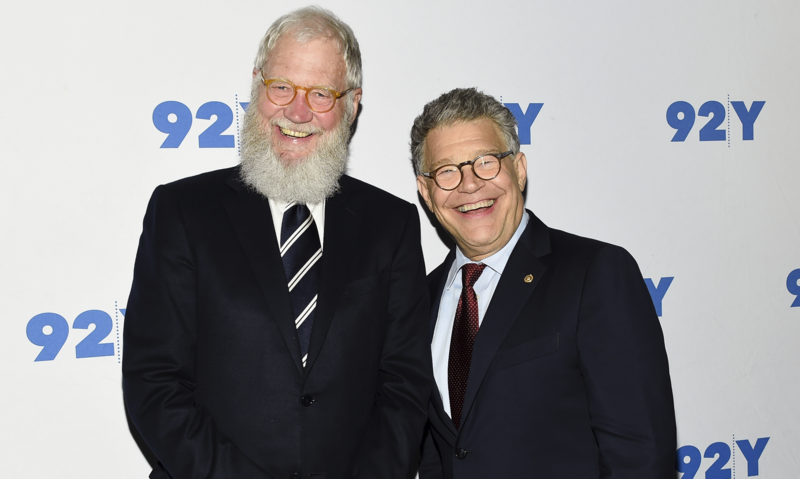 Mr. Franken’s circuitous path to the “world’s greatest deliberative body” started in the mid-1970s at Saturday Night Live, where he spent 15 years as a writer and performer before going on to become a best-selling author of political satire and a radio talk show host targeting right-wing media and politics. Who better to combat the absurd, dark joke at the heart of the rise of Trumpism than someone like Al Franken? The junior senator from Minnesota combines a keen intelligence and the rigorous instincts of a policy wonk with a deep understanding of media that enables him to detect the difference between manipulating an audience in the service of laughter versus a far more cynical agenda. Who better to combat the absurd, dark joke at the heart of the rise of Trumpism than someone like Al Franken? As Al Franken was trying to keep his humor in check, a large chunk of Americans were being roped in by one of the most disturbing jokes in U.S. political history. For all the vitriol Al Franken’s name evokes among conservatives—due in large part to his provocative 2003 New York Times best seller Lies: And the Lying Liars Who Tell Them: A Fair and Balanced Look at the Right—it is important to note that Senator Franken’s satiric analysis was prescient. It is not difficult to connect the dots between his long-running examination of the right-wing media echo chamber that has been growing since the early ’90s and the political ascendance of Donald Trump. But while Giant of the Senate resurrects Mr. Franken’s humor, it is also a window into something deeper. In the age of Trump, can Mr. Rogers help us manage our anger? Given the current landscape, it is difficult not to ponder the possibilities. In a classic S.N.L. bit from 1979, Mr. Franken declared that the ’80s would be “The Al Franken Decade.” One wonders if Senator Franken may have been right all along, even if he was off by 40 years. Wow. Talk about "puff" pieces! Senator Franken has a consistent rating of 100% from NARAL. He knows of no exceptions to the killing of a child in the womb. Usually you wouldn't think a Catholic publication would laud such an individual, but hey, this is America Magazine. I'm sure he's against global warming, so it's all OK. What frauds. Thanks for your comment, Kevin. I'm not sure that it's entirely fair to paint America with such a broad brush as there's a healthy diversity of viewpoints represented in its pages. I'm well aware of the Church's position on abortion, but as a culture columnist I'm trying to speak to and about voices in the culture that I believe are important regardless of whether they are in full agreement with the church on every issue or whether the subject is even Catholic (Franken is Jewish). Given the current situation of our politics in Washington I believe Senator Franken and his book are worthy of coverage. This was not a culture piece. This was hagiography, approval of Mr. Franken's struggle with "the absurd, dark joke at the heart of the rise of Trumpism." This was approval of his politics, and his politics, in this case unlimited abortion rights, is anathema to the Catholic faith. As I mentioned, if he did not believe in global warming or was against unrestricted immigration, would we see such an approving profile? I doubt it. Abortion, for many at America, is not a "deal-breaker." Here is what I honestly don't understand. Is abortion the only "deal breaker" for you. Does it matter what someone thinks about capital punishment or torture or making sure hungry children get food, or is it just abortion that is your line in the sand? I read Franken's book, and was impressed both with his insights and his willingness to see the humanity in people, other politicians, who view the world differently than he does. He is clear about what he thinks was inappropriate in the behavior of other candidates, and about where real disagreement lies, but he's also clear about the possibilities for agreement and even respect. If only Catholics could demonstrate such fair-mindedness. It would actually appear that the "dark joke at the heart of the rise of Trumpism" is the Coastal Elitism which supported and rooted for Trump's nomination as "a push over candidate" for its very flawed Hillary Clinton. If Mr Franken deserved "the prescient " title you have bestowed upon him, he would have understood that a huge number of Americans were simply fed up with being lectured , hectored and pestered to fall in line with the accepted coastal orthodoxies on pain of being deemed "unsophisticated". Mr Trump was/is a deeply flawed candidate and was weighed on the scales against the deeply flawed,no accomplishments Ms. Clinton: and Mr Trump was found on balance to be more acceptable. The pity is that the electorate was given two terrible choices but nonetheless had to vote for one of them. The real joke involving Mr Franken is that he did not recognize what was going on in his own normally reliably Democrat state where Ms Clinton barely eked out a 45,000 vote plurality! The stunned response of "the establishment" to Mr Trump's "victory" may ultimately be the only laugh worth noting. Thanks for the comment, Stuart. I would absolutely agree with you that Donald Trump's election was a complete shock to many "elites" not to mention many Republican friends of mine who were devastated that the GOP would support his candidacy and who couldn't bear to vote for him. By way of clarification, Franken's "prescience" wasn't about this specific election it had to do with his long running critique of right wing media and the misinformation they often present to a significant portion of the American electorate. The toxicity of that message has helped cement divisions in our body politic until a figure like Donald Trump was able to take advantage and win. I'm not sure that referring to the Senator as "Mr Frankenstein" is a particularly helpful addition to the conversation, but I would agree that the 2016 election drew on deep disaffection of a portion of the electorate that feels unheard and disrespected. I would imagine that there are plenty of ongoing conversations happening among Democratic leaders that are grappling with that very issue. But I simply can't agree with your characterization that Secretary Clinton had "no accomplishments." I think that is simply an intellectually dishonest argument. It is a false equivalency in my book to compare Secretary Clinton's flaws with the perpetual scandals that Donald Trump brought with him on the campaign trail and has now dragged into the oval office. You are perfectly correct on the reference to Mr Frankenstein .....I caught it happening on the auto spelling insert program but missed that one as I am a one finger typist who doesn't generally see the text as I type. I will edit this! As to the comparative flaws and lack of accomplishment I note that when asked to list Hillary's accomplishments as Senator and Secretary of State I refer you to her own campaign website which is full of broad based platitudes as accomplishments......standing up for women's rights as human rights; standing up for the LBGT community and frankly the biggest reach of all :Getting a cease fire between Hamas and Israel after a week in which Hamas took a beating. Consider that on her watch she pushed a "reset button" with the now deplored Russia; attacking Libya and leaving it in multiple Jihadi hands ; the Bengazi debacle and the follow up great video Lie;the flaunting disregard of national security rules and regulations; the Russian Uranium deal;etc. let's not forget the basic "pay to play scandal Clinton Initiative/Foundation" based on her presumed future ascendancy of the Presidency ....proven by the complete collapse of donations in the 3months following the election with the withdrawal of contributions ranging from the Arab States through the Government of Norway. That collapse was so severe that the Clinton Global Initiative fired its employees and closed. Trump's so called scandals are generally personal with no effect on the nation or its policies. Mr Trump is certainly guilty of endless stupid self inflicted mishaps but his so called scandals are mostly tawdry personal events and language. We have a elected a bar room narcissist in lieu of the prior upscale wine elitist narcissist. We have substituted the combative language for the didactic language and that difference alone grates the elitists who fail to recognize that most of America intuitively understands the bar room braggadocio and laughs at the tony sounds of the east coast political class. What you might appreciate about Franken's story is that he was not a "coastal elite," -- except for some time he spent working in New York and Los Angeles, but he was born and raised in a modest family in the suburbs of Minneapolis. One of the delights of this book is the stories about his family and neighborhood, and about the years he has spent touring his state as one of its legislators. It is so easy to paint with a broad brush when we don't know someone -- it is also easy to make characterizations about a place and a phenomenon without a closer look. I was glad to learn about Minnesota political traditions, the small town "bean suppers," and the reality of native communities in the northern part of the state. Very well put Tracy. I agree that the Minnesota Bean Feeds were an interesting part of the book. Mr Franken is to my mind a perfect representative of the liberal who wants desperately to belong to the right "wine club". He was an "easy mark " , another comedian olooking for acceptance in upper east side circles. I used to listen to him on Air America and never ceased marveling at the lengths he would go to insult religions traditions and beliefs as stupidly unsophisticated humbug. His anti Catholic.diatribes on Air America were in fact an issue when he first ran for office....( see Catholic News Agency Oct 28,2008 ) ..they included a skit about uncovering the skeleton of Christ still affixed to the Cross and going into business to sell his bones. Modest roots have never had much effect on the ambitions of a social climber who certainly tasted the east coast elitism at Harvard and discovered that anti catholic rants are just the right ticket. Nice Piece. From watching him on TV it's pretty clear he does his homework and cares about All American citizens. That he combines his intelligence with compassion is held in stark contrast with Ted Cruz. And that he has some media skills makes him formidable. It's not great political power, except for getting conservatives in an uproar. For those of us who have traditional catholic values, but also support working people, Franken exemplifies what we think politics should be about: "Politics is not about money. Politics is not about winning for the sake of winning. Politics is about the improvement of people’s lives." How different than our current political context, where it's money that sets the rules, vindication is the highest value, and the lives of the many are held to only be valued in subservience to the few. I don't know if he would make a great president, but then, we've gone from one of the finest to one of the worst. At least, he would make the campaign trail interesting. Thanks John. I agree with everything you said. I'm not sure Senator Franken is a viable candidate for national office either but with the rise of Trump it is difficult to say what constitutes viability any more. Oh, please, PLEASE run Al Franken for president. That would be a gift on a silver platter for conservatives! "I think the first thing is to be very slow to characterize your fellow Americans. I know that when people have to run for office they have to say “I’m smart and my opponent’s dumb,” or “I’ve got better ideas than my opponent.” That’s politics there’s nothing wrong with that. But, I get very very concerned when I hear people start characterizing their opponents as stupid. I still understand that because politics is a little rough and tumble at times, but I don’t buy it and when they start calling each other either crazy or evil. You and I, we don’t compromise with crazy people or evil people. And so, I don’t think that’s helpful. Generally speaking, just because someone disagrees with you doesn’t make them crazy or evil." Thanks for commenting, Brian. Not sure where you got "The American people are stupid," "Ted Cruz is evil," "Steve Bannon is a Nazi" from the piece? As a satirist, Franken was absolutely an incendiary advocate for his progressive points of view. As a senator, his rhetoric has been dialed back significantly. His job is much different now. To be honest--as I tried to make clear in the piece--a lot of his book is given to discussing the bonds he's been able to forge across party lines and his philosophy as a legislator (for my money, Wellstone's idea that "Politics is about the improvement of people’s lives" is difficult to argue with). He is still passionate about his beliefs but not in the same way he was in his books. As a senator he has displayed a level of decorum that Donald Trump seems incapable of mustering as our President, which I find deeply troubling. In terms of Ted Cruz he took great pains in my interview with him to clarify. Here's what he said about the Cruz chapter: "I tried to point it out and I tried to justify in the chapter that I didn't just do it for the fun of it. But Cruz was kind of the exception that proved the rule. The rule is that most people [in the Senate] actually make a real attempt not to just pitter patter but to make sure that their word is good. You know that's kind of why I told that story [where Ted Cruz outright lies to him on the Senate floor about a point Franken had made]." When a true giant of the Senate like Bob Dole comes out during the Republican primary and says that Trump would be a better choice over Cruz you begin to get the idea that Franken isn't alone and that there is real truth to the idea that Ted Cruz engenders a passionate dislike in both Republican and Democratic Senators. In terms of Steve Bannon being a Nazi? Franken never said anything of the kind. Nor would I. I will say that if you don't see Bannon's ideas about issues like immigration, culture wars and the role of government as on the extreme fringe then we will have to agree to disagree. I see nothing charitable in the fear-based way the man looks at many issues facing our country. In terms of your General Mattis quote, again, Franken says nothing of the kind in this memoir. He absolutely disagrees with Republicans on a host of issues but he doesn't resort to the tone of the satire he became known for. As an aside, when I asked about his concerns regarding North Korea, he was very sober in his assessment but he also said "I trust people like Mattis and McMaster to not allow us to do something that is really awful." Thanks for a closer look at Senator Franken, who is a fascinating political figure. Would that more of these figures, at all levels of government, remember that their jobs are about public service, the common good, the general welfare. Why is a man who openly mocks Christ, viciously attacks the Catholic Church and Her sacraments and all things sacred, who publicly and shamelessly derides her doctrines, worthy of praise by any writer in a Catholic magazine? Is politics more important than the Catholic creed? How is it that Senator Franken is better than President Trump? Why is Trump so wrong and can do no right? How can Mr. Franken's stance on abortion, his lewd and blasphemous jokes, his contempt for the clergy, his public anti-Catholic commentaries make him acceptable to any Catholic, who, if a good Catholic, holds the teachings of Christ above any political agenda? How does America Magazine and the Society of Jesus, once stalwart defenders of all things Catholic, allow such a piece to find a home in its pages? You made comment about the magazine being diverse, but the truth must be: diversity be damned if diversity be opposed to Christ. My goodness. I read Franken's book cover to cover, and saw no mocking of Christ or the Church. Pardon me. I should have clarified. I am speaking of a man who is more than a book. I am speaking of his career, which he does not reject in his book. It makes sense, I think, that if the current policies of the current President might be read in the light of his pre-presidential comments, then we ought to hold Mr. Franken up to the same standard. Throughout his whole career as a comedian, one can find his humor stained with slanders against the Christ and His Church. I am glad to see that so many readers have called you on the hypocricy of praising Al Franken in a "Catholic" publication. Franken failed as a "movie". His election history is sordid and was loaded with accusations of dishonesty. Watching him during hearings shows him to be a partisan, pompous, left-wing ideologue. And----you can not so easily his support for the horror of government funde abortion---if you like planned parenthood---abortion-on-demand, late term abortion, selling baby parts----fine for you---but not with the tax dollars of Catholics who are faithful to the Magisterium. Your hatred for TRUMP shows through. Would you really have preferred Hillary? I would be pleased to see Al Franken run for president. He speaks clearly. He makes sense. And he has the right priorities, evidenced by the statement "Politics is about improving people's lives." "Improving people's lives" is another way of saying "working for the common good." Using a politician's stance on abortion as a litmus test gave us a treasonous, corrupt, and incompetent president. There are more issues to consider than abortion. And if he laughed at the Catholic Church, so what? The Catholic Church provides plenty of material in the arena of "laugh or cry - take your pick." I am glad to hear about Mr. Franken's book. It sounds like it is worth reading. The " Catholic Vote" was practically a dead even split between Clinton and Trump. These pages first reported a slight margin for Trump and later reported a slight margin for Clinton. The explanation you seek for Trump's win cannot simply be attributed to the "abortion issue". It seems you are desperately searching for some one/thing to account for how a first time politician;with no campaign experience;spending half of his opponent;using a miniscule staff; and who was opposed by every media source and even opposed by his who own party establishment could possibly have won. I suggest you stop blaming the abortion issue and focus on the comparative qualities of his opponent. Great phrase..."common good" ! Does that term have a definition that fits its fine sound?.....or is it just something you know when you see it in action? Strikes me that the term could be easily used to define a goal or even an excuse for why certain action was/ or is to be taken! Also strikes me that one man's " common good" might well be another man's world of hurt. It has a Margaret Sanger ring to it when applied to certain topics. Hi Stuart, My apologies for not replying to some of your other comments above. I've been busy working on another project and I wanted to make sure I didn't just toss off a quick reply without giving it some thought. Though I think I should mention that we've drifted pretty far off the original topic. You mentioned in a comment above that "We have a elected a bar room narcissist in lieu of the prior upscale wine elitist narcissist. We have substituted the combative language for the didactic language and that difference alone grates the elitists who fail to recognize that most of America intuitively understands the bar room braggadocio and laughs at the tony sounds of the east coast political class." Truth be told, I think you're dangerously oversimplifying reality and reducing very real issues into cartoonish categories. We live in an increasingly complex and interconnected world . The notion that Donald Trump is just trafficking in 'bar room braggadocio' suggests that this is all a relatively harmless exercise in chest thumping. Unfortunately, the consequences of a chest thumping approach to the issues facing our country and the world could be disastrous in terms of human lives lost, not to mention US leadership in the global community. Trump's unorthodox campaign and organization were an asset as a candidate but they've turned into liabilities as President and have immersed his administration in paralyzing scandals. As to MY possibly dangerous oversimplification: well if it's over simplification and cartoonish you see, I respectfully suggest you reread your own text ....half the country votes for a non politician to head the highest office in the land and you refer to it as "the absurd dark joke of Trumpism" and "a chunk of America being roped in by one of the most disturbing jokes in U.S. political history". You demonstrate exactly the failure to understand what was/is motivating a half the country (not a "chunk" as you dismissively refer to it) as was demonstrated by my above referred to Coastal Elites. When you look at the U.S map by counties, colored in Red and Blue to reflect the presidential vote ,it becomes screamingly clear that there is a whole lot more going on than some "absurd dark joke". The failure before the Trump election and the failure afterward evidenced by your own dismissive article continues to demonstrate you don't want to know "the how, what, why" of what happened but would rather just scream in anguish. It simply cannot be that Hillary lost! I have spent some time on the topic of "how and why" by talking to people who have college and graduate degrees on the very simple theory that they probably paid the most attention during the election process. The parameters of this very unscientific survey( which was well over 100 people) demonstrate to at least my satisfaction that far more of this group voted Against Clinton than For Trump. The Supreme Court nominee and the massive intrusion of government into every aspect of life seemed to be the two most often mentioned reasons.The third most often mentioned item by this group was the inability of the Clinton campaign to articulate any of Hillary Clinton's accomplishments other than generic junk like "she stood up for children and women's rights" as against the very obvious problems like Benghazi, the Russian reset, the "pay to play" of the Clinton Foundation etc.. Interestingly a number of the people I talked with were deeply offended by "The we know what is good for you " attitude of the East Coast papers. ....a feeling of being what I summarize as "lectured, hectored, and pestered"
So while as you fear the results may actually be disastrous, I refer you to the condition of the world at the end of the Obama term: the Ukraine invaded; Crimea seized; millions displaced in Syria; Europe being destabilized by the onslaught of refugees; Isis taking over half of Iraq and spreading to 100 countries; Libya destabilized into a Jihadi failed state; china seizing South China Sea islands; North Korea testing ballistic missiles; Iran testing ballistic missiles; Turkey rejecting its secular foundations; ......all in the context of Obama's not so sotto voce comment "Tell Vladimir that after the election I can be more flexible". I don't recall Senator Franken being anything but 100% behind this cascade of international fiascos. I won't bother to list the Obama admin "scandals"
I absolutely agree that between Trump trash talk and the blatant Media bias we are degenerating rapidly into National version of the Jerry Springer Show. Maybe the 'dark joke" is how business as usual is obstructing progress on important issues that many Americans need. that, my friends, is the dark joke. This article also appeared in print, under the headline "The ‘Al Franken moment’," in the August 21, 2017 issue.